When I posted this recipe 6 years ago I didn’t know it would become such a staple in my Christmas gift giving repertoire. 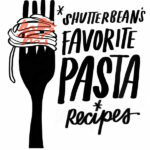 I also didn’t know much about food styling & food photography! It’s amazing what can happen in 6 years, right? Like…I have a 5 year old! CRAZY. I decided to rehash this recipe because I feel like it NEEDS to be shared. It seems like everyone has a good peppermint bark recipe, but most of the ones I encounter have a full chocolate base…and that makes me…THIRSTY. I can only each a small bite and them I’m out. 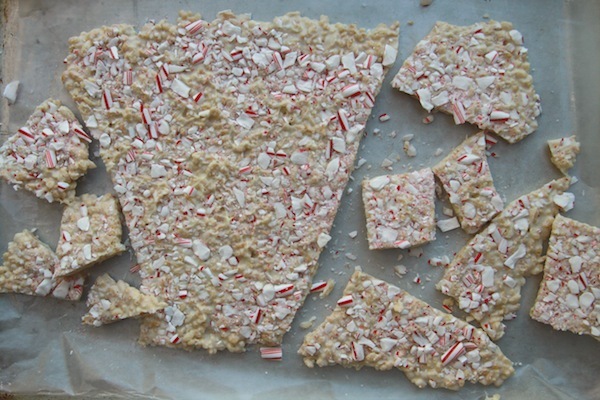 I love this recipe because it’s different and I can’t stop eating the bark when I start…It’s because it’s creamy & crunchy because of the combination of good white chocolate, Rice Krispies & mashed up candy canes. It’s always a hit with the company I keep. Everyone dips into their stash the moment I gift it to them. That crunch is ADDICTIVE. You’ll see. I have another bark recipe coming this week that’s a riff off of this one. I can’t wait to share that one with you so please stay tuned! Since I’ve been making this recipe for the past few years, I have some tips. I used to hunt ALL OVER THE PLACE for bricks of white chocolate. One year my favorite grocery sold it and then they stopped and I had to pay a crap ton of money for a brick at the only place I could find them. I have found that you can definitely use white chocolate chips for the recipe. I fell in love with Guittard’s Au Lait Chips. I buy a few bags and make at least two batches. The quality is very good and they melt really well. 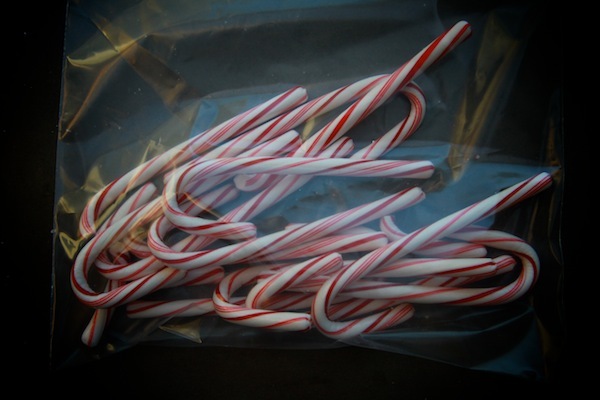 Originally, the recipe called for peppermint candies, but I’ve found that candy canes work just as well. I use about 6 per batch. I always bash up more though because I make A LOT at once. Candies get unwrapped. Now put them in a plastic bag. BASH. Transfer all the bits to a bowl. If you have any dust separate that and mix it in whipped cream and put it on your hot chocolate for a tasty treat! Also–another shortcut! I microwave the chips in a microwave safe bowl. Three increments of 30-40 seconds on high. 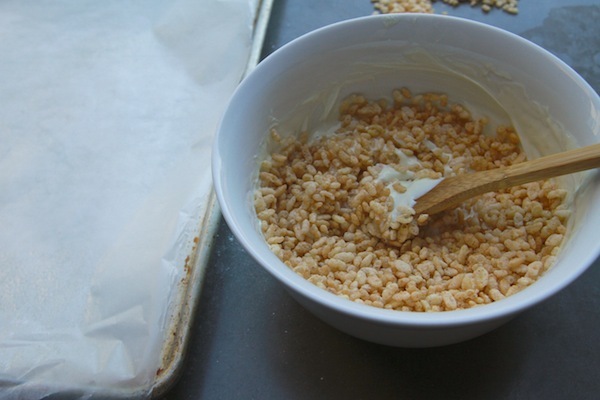 Mix the cereal in with the white chocolate. Line a baking sheet with waxed paper. 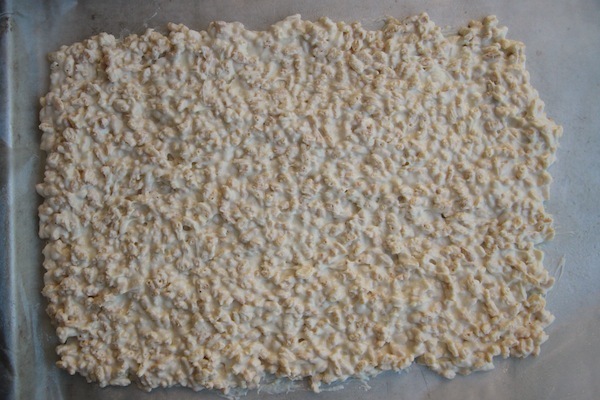 Spread the mixture on the sheet. We’re gonna make a rectangle. Rectangle is done. Don’t worry about smooth edges. Now we add the crushed candy canes on top. So easy. 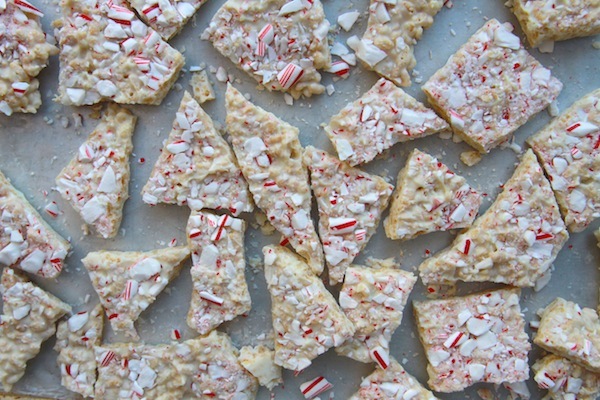 You take another piece of wax paper and you push the candy canes into the bark. This is so they stick. You let them set up in the fridge for about 20 minutes. 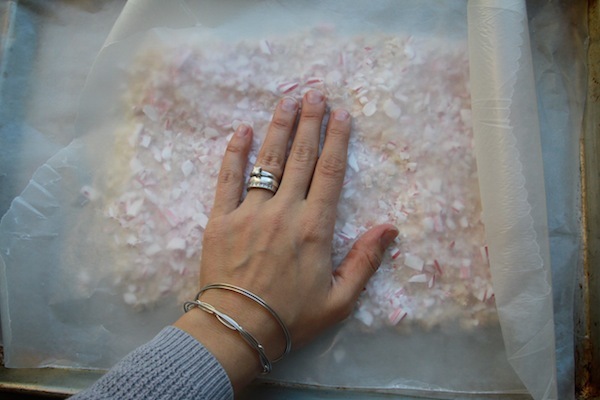 Take the wax paper off and break into pieces! I always use my hands. It’s kinda fun. No two pieces are alike. I usually pack 4-5 pieces up in little baggies. Makes enough for 8 gifts. Your holiday gift giving just got reeeeeeeeeeal easy. Oh! If you’re looking to branch out, add chocolate drizzle on top! 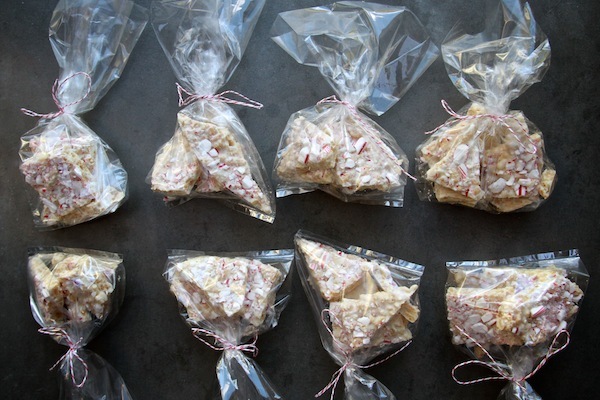 Before you put the candy canes on, put the bark in the fridge for 20 minutes. Then pour a layer of dark chocolate on top. 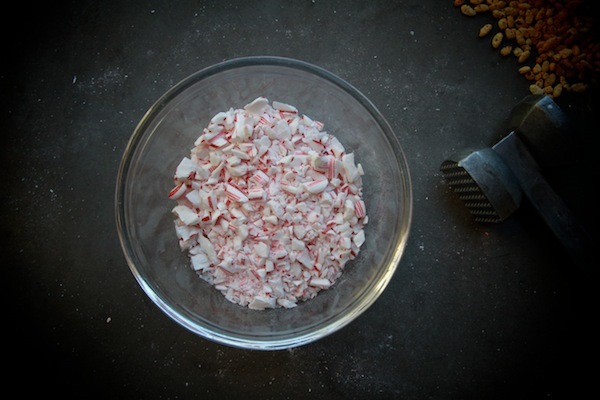 THEN add the candy canes and throw the mixture back in the fridge. 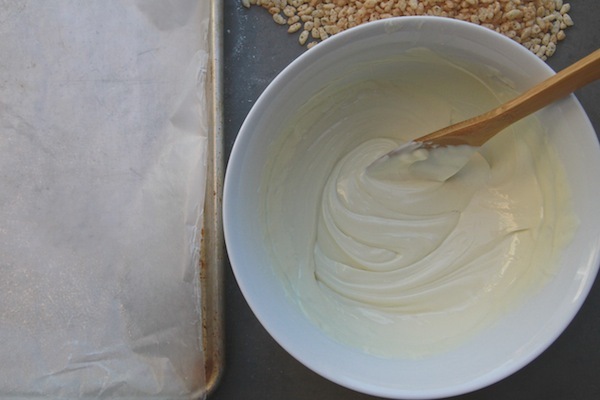 Place white chocolate in a heatproof bowl set over (not in) a saucepan of simmering water. Heat, stirring occasionally, until smooth, 4 to 6 minutes. Alternately, you can melt in a microwave safe bowl in the microwave. Heat for three 30-40 second intervals on high power until melted. Remove from heat; stir in rice cereal. AHH! a delicious treat with only 3 ingredients?!!! i’m so glad you re-posted this. it looks like it could soon become a staple in my house, too! This looks amazing. 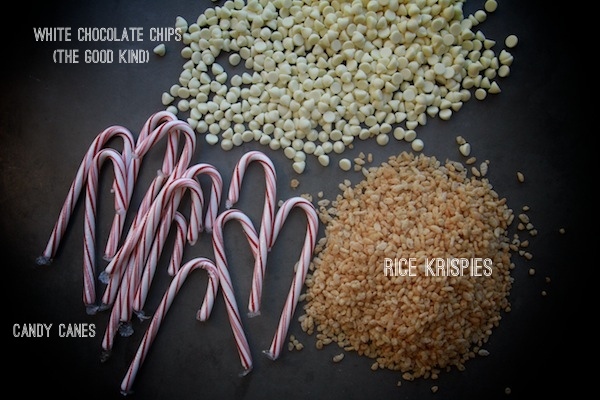 Love the idea of putting together simple treats as Christmas gifts. 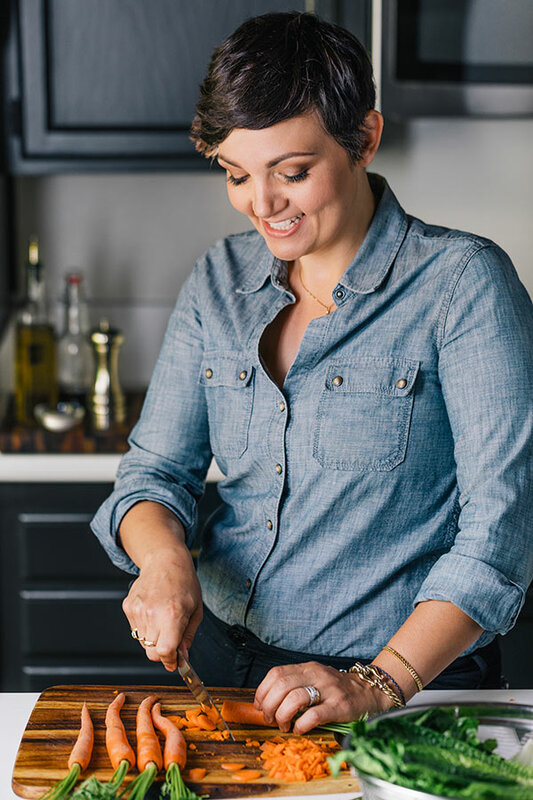 I’m planning on doing chocolate-dipped figs with sea salt this year. oh yum! these look so easy and so good! 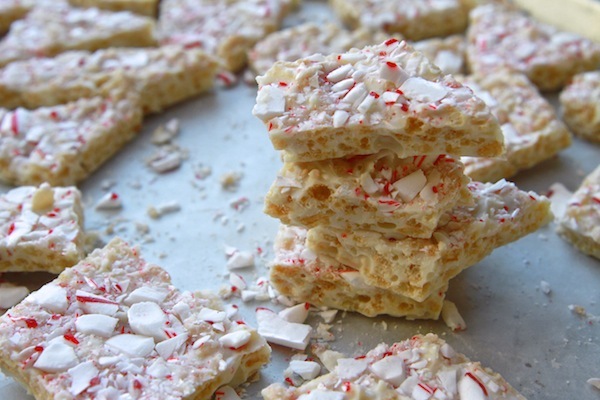 I’ve been looking for a peppermint bark recipe with a little something special. 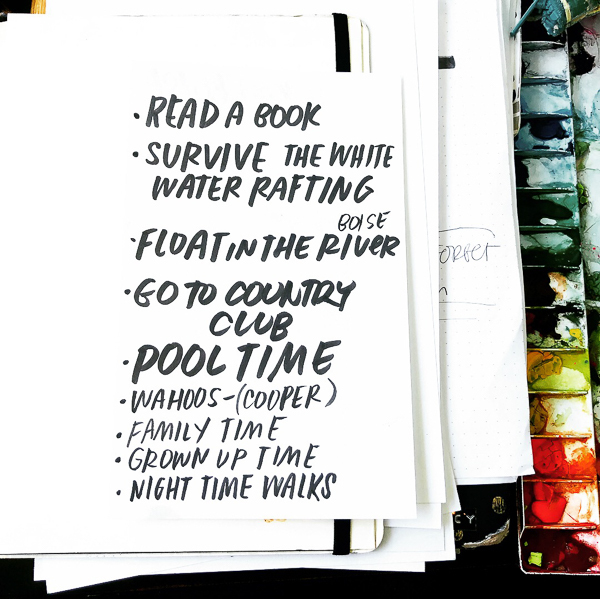 I think I’ll try this one over the weekend! 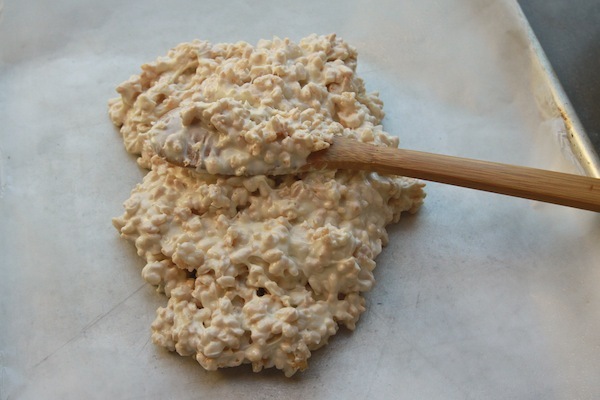 This looks amazing, I love the texture of rice krispies so I am sure I would be addicted to this in a second! 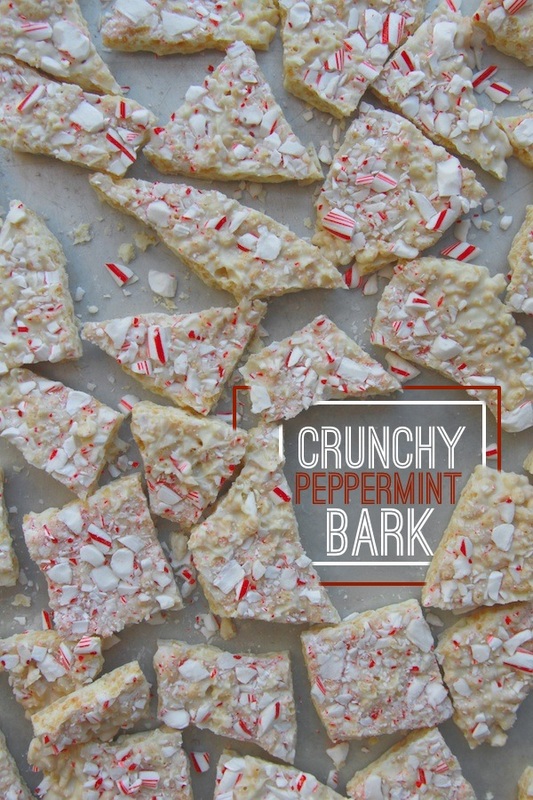 I also used peppermint in a recipe this weekend, yum! Pinned! This is so pretty and I love the rice krispie addition—genius! Right??! Why are those wrappers so hard? AND THEY STICK TO YOU. Not easy. I’m so glad you liked them. YAY. This stuff is so addictive and delicious! AND your food styling and photography has gotten a billion times better since you posted that recipe! 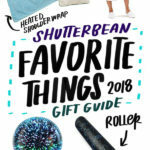 You have the best holiday gift ideas! Thanks for sharing! Just read this in bed this morning, and already went out to get the ingredients to make it this afternoon! 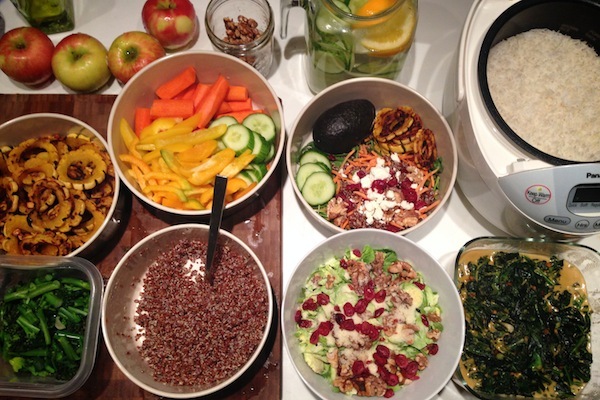 It looks so easy and delicious! Just a quick question, if sending it as a holiday gift, is there any way of making it last longer? Perhaps in the freezer? The freezer would be good- you just have to be careful about introducing moisture to them or the candy cane part will get weepy and chewy. Honestly;..if you keep them covered and at room temperature they should last quite awhile! 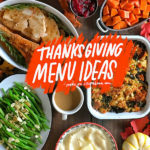 This recipe looks delicious, and would make a great holiday gift. I do have one question, though how’d you crush the peppermints? Put them in a plastic bag and smash them. You can use a wooden spoon or a mallet. 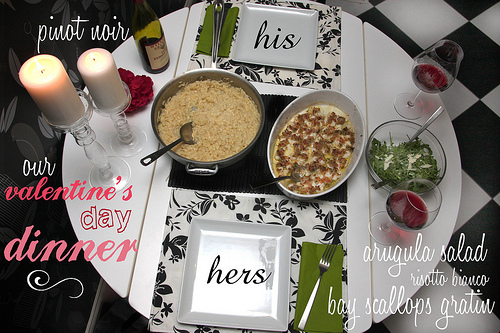 My husband might love me more if I make this for him. Do you think it would work with stirring in a tsp of peppermint extract? I like minty peppermint bark. Just curious. What an easy and lovely recipe. I am going to try it. Thanks. I’m sure it would work. The only thing I would say is that it might take away from the white chocolate taste. You’ll find that it’s super minty already with the crushed candy. 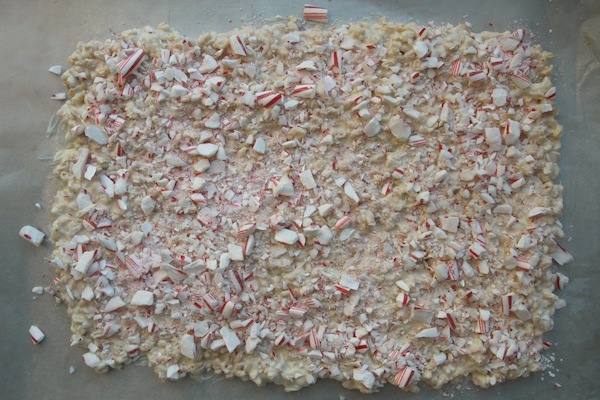 We started making bark a few years ago and I happened upon pre-crushed candy canes! That’s right, all that peeling-off-the-wrapper work is done for you as well as the hammering in the baggie. They’re available on Amazon–Atkinson’s Mint Twists Crushed Peppermint Candy! Wow! 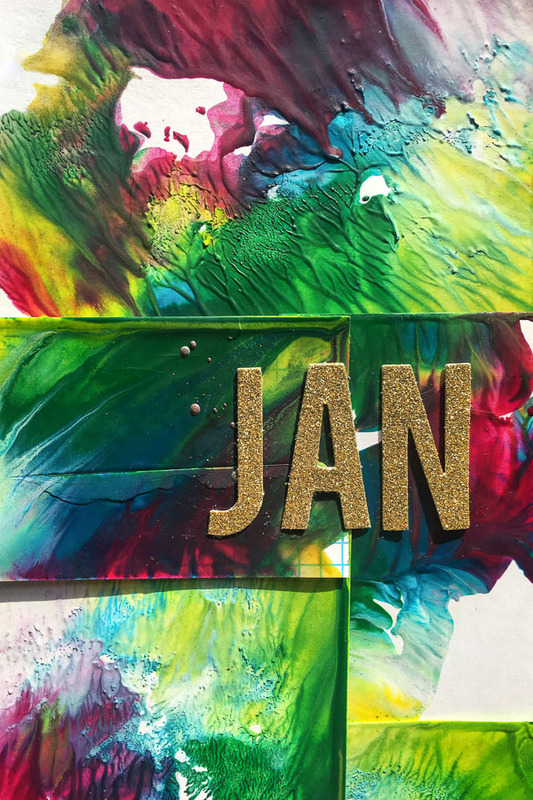 I just finished making these and they were so easy! 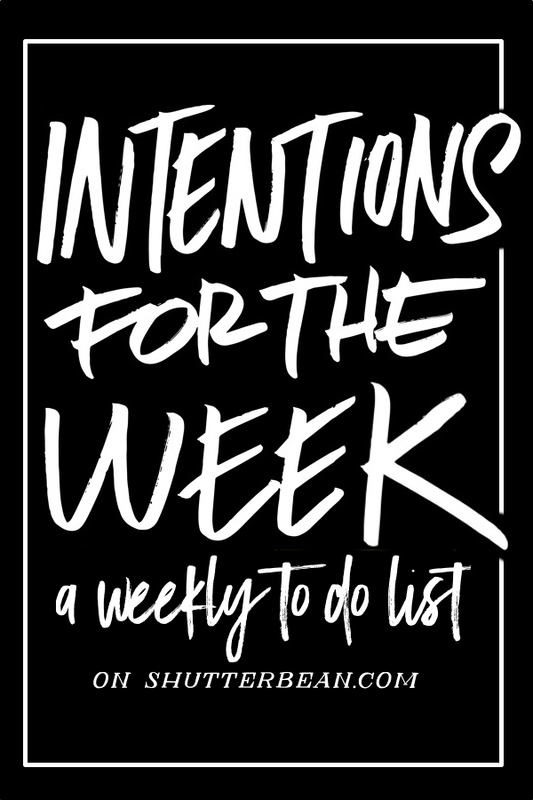 Often times, I read a blog post then discover its not as easy as it looks, but these were! Plus they look adorable and are delicious! Thanks for a great recipe! WOW, time flies! These have been part of my holiday ritual since you first posted them. Sooo good and so easy. Um, puffed rice cereal goes IN the bark!?!? Amazing! Omg Tracey! I made these tonight just as a test run….holy hell, I can’t stop eating them and I’m not really a fan of white chocolate!!! It’s the krispies that make all the difference. Btw, I used Trader Joe’s white chocolate chips because I read somewhere once that they’re actually Guittard. Brilliant recipe! Just made a batch using semi-sweet chocolate for all the neighbors. So quick, easy, and amazingly addictive! 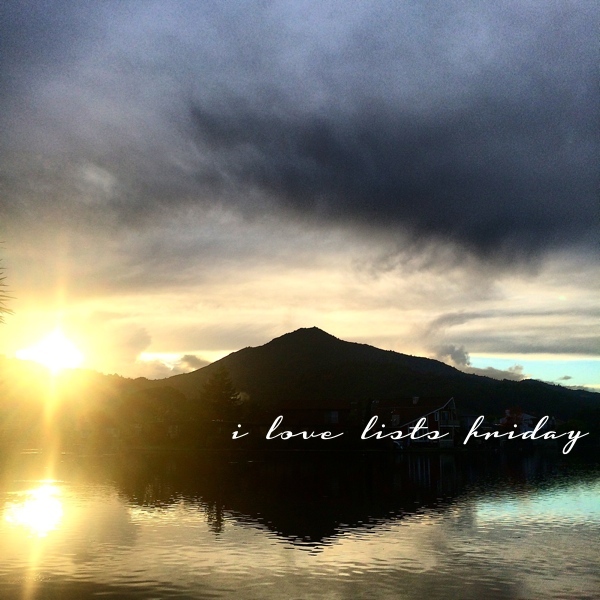 Thank you for re-posting! This recipe is definitely a keeper. 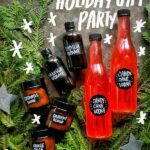 I was just debating what to make for my work holiday party on Tuesday. And I’ll get back home around 10 on Monday- this is perfect. 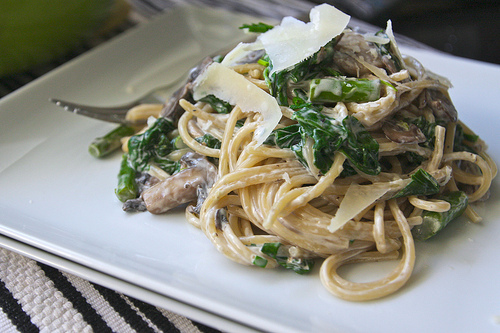 Simple, delicious and quick. You’re a real time-saver! Hate to be a party pooper but for those of us (I’m sure there must be at least one other person) who don’t like white chocolate… would regular chocolate work? I just made this and it is awesome! Just the right amount of peppermint for me, not overwhelming. Love the cereal in it, makes it so light and crispy! This just seems too easy to be true. Also, in our tropical heat right now, I wonder if they can keep in room temperature. Bear in mind, coconut oil exists in a liquid state here. I really wanna make this as gifts though. i think you could keep them in the freezer? maybe? I decided to go the marshmallow route this time because it just seems like it’s easier. But I’m copying your flavours with the candy cane but adding a drizzle of dark chocolate on top just for colour. Using brown rice puffs and honey for extra nuttiness. Hope it works! 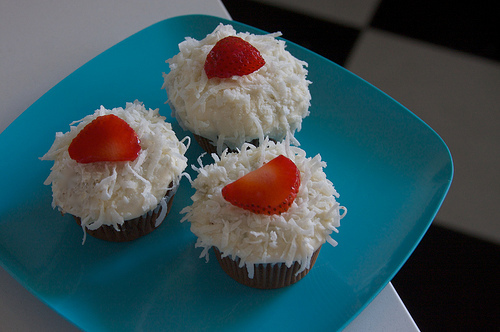 I just made these and they are so easy and yummy. Thank you for sharing. I made a big batch for Christmas gifts. Thank you! this is some next level bark. so dang good! thanks! This is the best stuff ever! I made several batches of it it last year and today I’m starting on the beginning of this years. Definitely going to be an annual tradition recipe!